Since the “Arab Spring” uprisings of 2011, several economies in the Middle East and North Africa (MENA) have been stuck in stagnation. In some countries – including Algeria, Sudan, and Turkey – the high cost of living is among the issues that recently drove protesters to the streets. In Egypt, it is a series of austerity measures that are causing families to feel the pinch. Imposed as part of a $12 billion IMF loan agreed in 2016, the program has caused a sharp spike in living costs. Presenter Randa Rizkallah (right) and Counsellor Dr Amany Shoukry discuss how to start a small business on Speak Up. Recognising the devastating impact of these financial pressures, several SAT-7 ARABIC shows are stepping in to help. The counselling program Speak Up recently featured expert guest Dr Amany Shokry, who has helped families across urban and rural Egypt support themselves with small businesses. Dr Shokry offered valuable tips for those considering a start-up to supplement their income, including the importance of market research, starting small and scaling up, and how to attract customers. 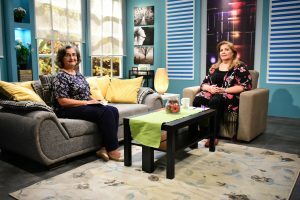 Career coach Samy Salama also offered advice on identifying avenues of income, and viewers were encouraged to get in touch to be connected with organisations that can provide loans. Over on the women’s program Needle and New Thread, the focus was on young people, who are among those worst affected by high unemployment. Dina Makram, a 28-year-old entrepreneur who struggled for years to find a job, shared her story. Since then, Makram’s business has flourished. Even better, she says, she is doing what she loves. As help to start a small business can be hard to find in some MENA countries, the channel’s support will be priceless for many trapped in generational poverty or starting again following conflict, as well as those squeezed by rising living costs. And, in Egypt, greater constructive focus on start-ups in the media has been identified as a factor that is needed for the economy to thrive. So, SAT-7 ARABIC is not only supporting individuals – it is also helping strengthen an entire society in need.